If you have just arrived at this project then you might want to to go back to Part One which can be found here, this will give you the steps needed to achieve your basic bicycle washer. The following shows the modifications I made to perfect the machine, making it easier to pedal and also giving us some 'spin cycle' too! 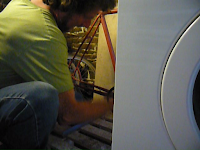 Update - I have recently completed a 'new' pedal-powered washing machine as this one finally sprung a leak after years of great service. The new one is a top loader and also has wooden stands. Due to requests from subscribers, I am writing this project up in step-by-step detail. There are also tips on removing and recuperating materials and complete photographic documentation of each step in the conversion. The first in this series of what will probably comprise 5 articles with their respective films has just been published and is available through the link at the end of this article. Apart from the many other advantages of a pedal washing machine - saving on bills and energy consumption, fitness, fun, and time to read... everyone wants to do your laundry. Family, here on vacation, including the children, actually ask us to save up some washing! Even passing holiday-makers stop and ask to have a go pedalling. What could be better than to give them enjoyment and get your laundry done to boot! The first arrangement had a 1:3.3 ratio from the bicycle pedal crank wheel to the gear on the motor shaft and between the motor and the drum pulley a ratio of 14:1. Thus providing an overall gear ratio of: 4.2:1 i.e. just over 4 rotations of the pedal crank to get 1 revolution of the drum. No wonder 1 felt very little resistance when pedalling.. I thought that the gearing ratio should be at least 1:1 that is one revolution of the crank would produce one revolution of the machine drum. To this end, I disconnected the drive belt and screwed to the face of the large pulley wheel a pedal crank wheel from another bicycle. The drive chain was attached to this crank wheel. I had to increase the chain length by about 6-8 links to get it to fit. I had determined this to be the minimum ratio as I believed pedalling/drum speeds of around 40-50rpm allowed the contents to be sufficiently agitated for effective washing. At this speed, one could feel the load changing as the wet laundry was picked up in the drum by the paddles and then fell back to the bottom of the drum due to gravity. This cadence was very easy to maintain even when the direction of pedalling was reversed. Unlike with the first highly-geared arrangement I had, the load provided a resistance to the pedalling which actually made it easier. We’ve exhibited this machine on many occasions and the most frequent comment from spectators has been ‘let’s see you spin dry now!’. Modern washing machines have very high spin speeds (in the region of 1200 rpm or even greater). The need for these increasingly higher speeds is questionable as the additional amount of water extracted is relatively small. (See end of article for links to 'The Great Spin Debate'). Reading through it, it seems that so much, if not all, the escalating speeds are nothing more than sales gimmicks and may result in damage to the laundry. Nevertheless, being able to remove some water prior to removal from the machine was desirable so I started by calculating what kind of drum speeds were necessary to keep the contents held against the drum wall for the complete cycle i.e. drum speed needed to overcome the acceleration due to gravity. Obviously this rotational speed varies with drum diameter and I've included at the end of this article a link to determine G forces. With sufficient force holding the garments to the drum walls the water can escape through the holes in the drum. Higher rotational speed will obviously increase the rate of water loss. For our drum of 46cm diameter, a calculated speed of 62.3 rpm would mean the contents would experience a force of 1g. Fast pedalling I could achieve a consistent speed of 100rpm producing a force of 2.6g but, if I dismounted and turned the pedal by hand I could achieve 170rpm producing a force of; 7.4g. Such an action produced a significant increase in the flow of water leaving the drum but it was not possible to maintain this speed for more than 60 seconds or so. On removing the garments there was still a considerable amount of water in each item which could be extracted by wringing by hand. After using the machine in this arrangement for 18 months or so I found a leak had developed in one of the flexible hoses connected to the pump. The end result was I found it easier to remove the hoses from the pump cut out the perished part of the tube and re-connect them via some rigid pvc pipe, bypassing the pump completely. Without a doubt removing excess water at the end of the process is the most significant improvement to make. To this end I have obtained from my local dump another non-electronically-functioning washing machine. I propose to set this up as the bicycle-powered washing machine and to convert the existing machine to a more efficient spin-drier by altering the gear ratio. When setting up this next machine I will endeavour to fix the drum more securely to the machine frame. This, I now realise, would be an ideal use for the brackets normally supplied by the manufacturers specifically for transporting the washing machine. Next year I intend to design and create a solar water heating system which will link directly to the machine. This will obviate the need for the alternative hot water sources, we use at the moment, viz water heated on our wood cooker and in Summer, by means of a couple of plastic bush-shower bags. 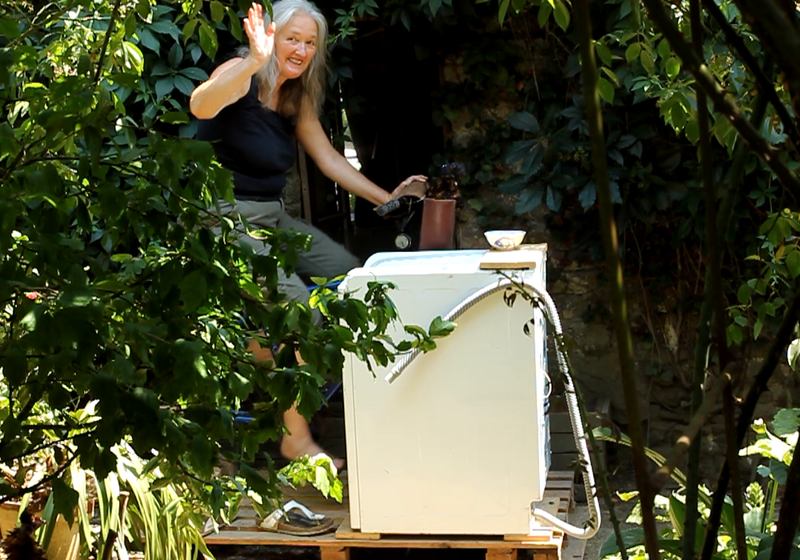 Have washing machine, will travel! All the best and thanks for dropping by. Please feel free to share this article, comment and/or ask for further information. Have you considered measuring the impact that this may have on your health? I'm wondering how many calories you may burn, how far you would cycle per wash if you had had wheels on the bike and that sort of thing? Any particular reason why you haven't fitted the front gears from a mountainbike to get some significant intervals in ratio? Hi Christian, point taken about the extra effort two children would make to your load! You could plan ahead and set up a child's bicycle to a washing machine, start 'em young! No I haven't made any study of health impact but I am considering installing a counter so that I can monitor how many revolutions I do to a wash. 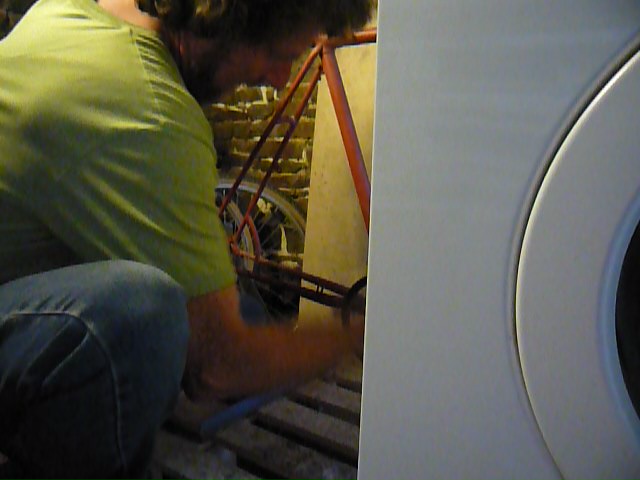 When Sue does the laundary she pedals 100 revolutions for each stage of the wash cycle, I on the other hand read a book, if I get too absorbed in the subject matter then I reckon I pedal on the washing stage for about 30 minutes which I reckon to be at least 300 revolutions! As regards to the gearing, I believe that would be a good idea for obtaining higher spin speeds, but I am taking a different approach as I mention in the post above, that is to have a separate machine for washing and one for spin-drying, the latter to have a higher gear ratio to achieve this. 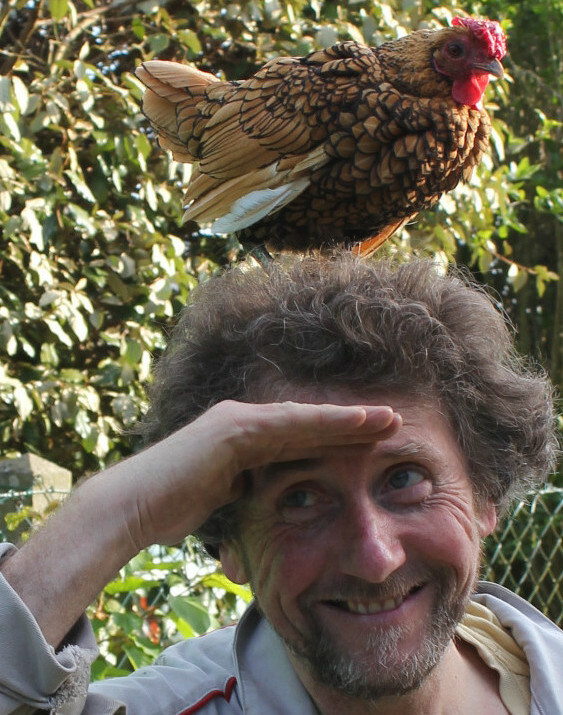 Many thanks for your comment and Best Wishes from Normandie, Andy. What about making one using a recumbent bike design. I have back issues so I can't sit on a regular bike but I would love to do this for my laundry. So far you are the only one that I have seen who has made a wonderful working project. I have 2 kids that want to help with doing this so the seat would have to be adjustable. I really want to build one of these as I need to use less electricity and hate having to go into town and pay for laundry. Well thanks for liking the project. I do know there have been several feet-forward designs posted on Youtube try searching for 'human powered washing machine'. 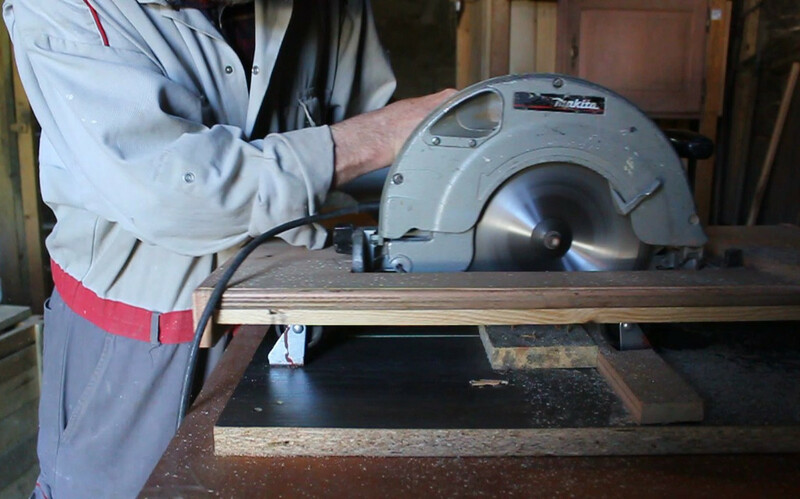 It is fair to say that the method of fabrication is absent, but it may give an idea for the layout. The other thing is to google 'foot-powered washing machine' or 'foot pedal washing machine' I think in the latter is a great video by India Innovates illustrating a simple but effective configuration you may be able to use. Good luck and if there is anything I can help you with please drop me a line. This is really worth reading article. Thanks for sharing this, it will be great for me if you write more about Inverter Air Conditioner Price in Pakistan, Washing Machine Price in Pakistan, & Water Dispenser Price in Pakistan. The blog post is absolutely fantastic! Lot of information is helpful in some or the other way. Keep updating the blog, looking forward for more content...Great job, keep it up.